Speaking of Christmas, can you believe it’s a week from Friday?! The hubs and I finally started our Christmas shopping this weekend and it was crazy out there. Everything is super busy and people are generally a little nutty. 🙂 We actually got a lot done though, which was a relief. Soon, I’ll hopefully get around to planning meals for the days around Christmas. The hubs is actually going to be getting his wisdom teeth pulled (yes, at the age of 30 🙁 ) so I imagine I’ll need to plan some softer foods as well. I have no doubt eggnog will be in the mix. 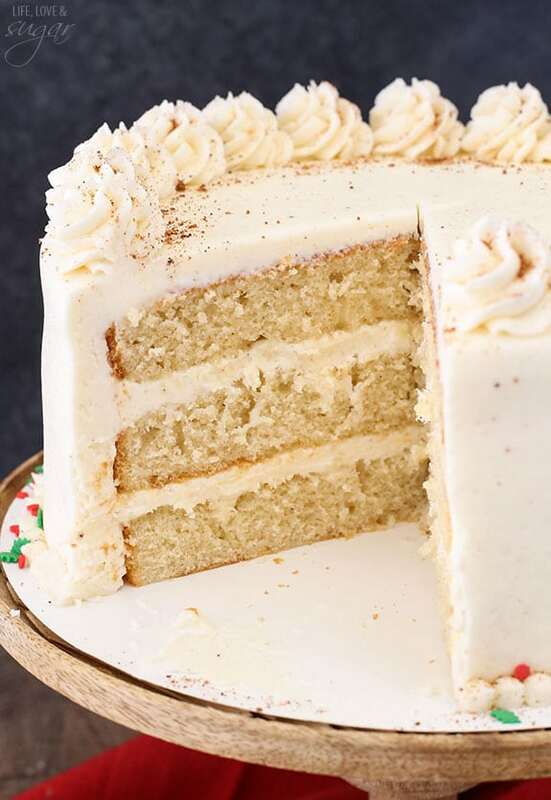 Eggnog is easily a favorite for us and there is no mistaking it’s presence in this cake. 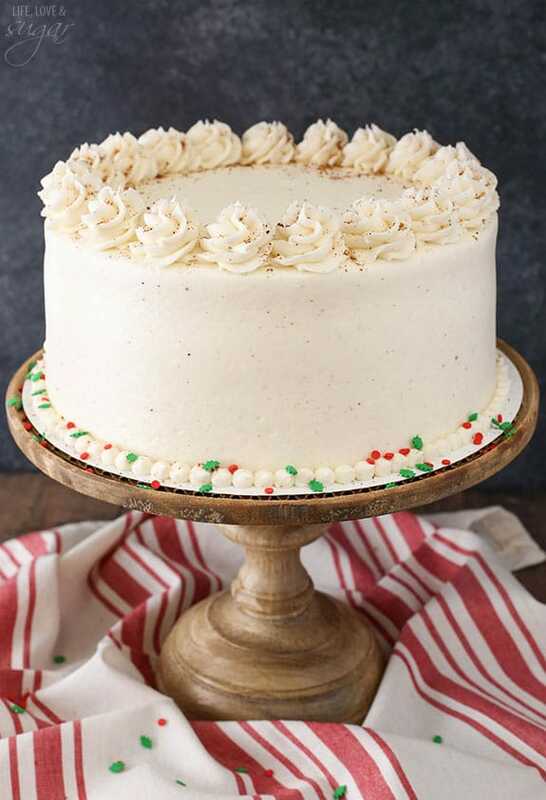 If you’re wondering which one I used in this cake, it’s the Souther Comfort regular eggnog. It’s our favorite and we pretty much stick to that one. To put the cake together, start by creaming the butter and sugar. This step is very important. Creaming the butter and sugar actually creates bubbles which will expand as the cake bakes, resulting in a light and fluffy cake. If you don’t cream them enough, you will end up with a denser cake than intended. And that would be sad. The other important thing about creaming is that the butter needs to be room temperature. 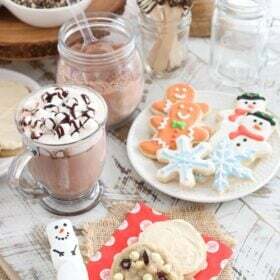 If it’s too cold, the sugar won’t incorporate well. If it’s too warm, the air bubbles will collapse. So basically what I’m telling you is don’t underestimate this step. I often hear that cakes turned out denser than intended and this very well could be the reason. So use room temperature butter and cream it with the sugar for at about 3-4 minutes. 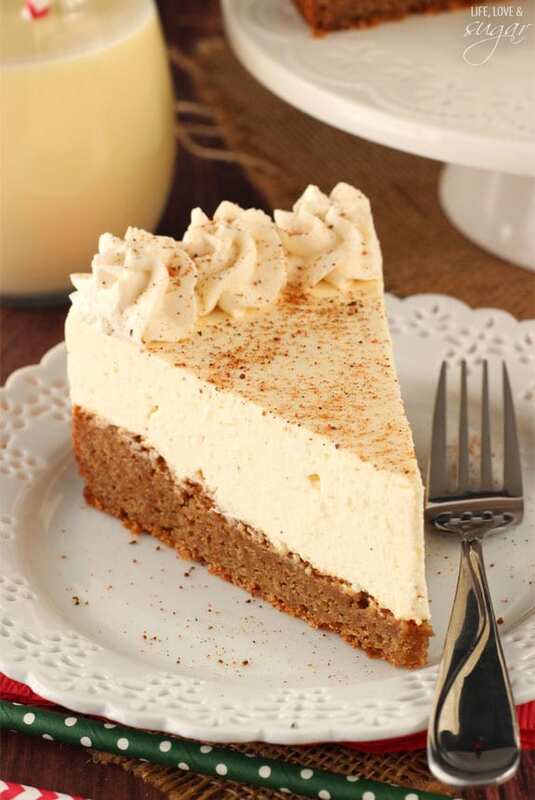 Combine the dry ingredients in a separate bowl and combine the eggnog and water in another bowl or measuring cup. You’ll add about 1/2 of the dry ingredients, then the eggnog/water mixture, then the remaining dry ingredients. Alternating the ingredients helps preserve those precious air bubbles we added when creaming the butter and sugar. Beginning and ending with the dry ingredients helps to keep the batter from curdling. 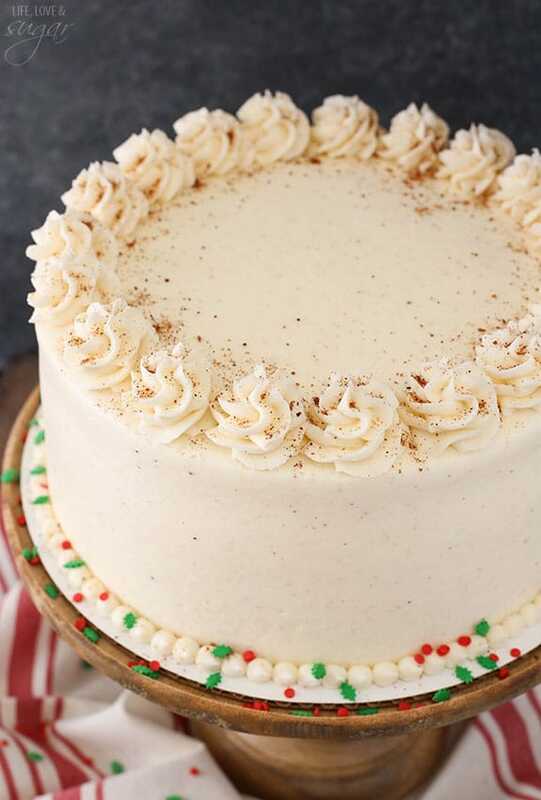 The cake is covered with a wonderful eggnog frosting spiced with nutmeg and a little bit of rum extract. If you’d like a little guidance on creating that smooth finish, check out my tutorial. 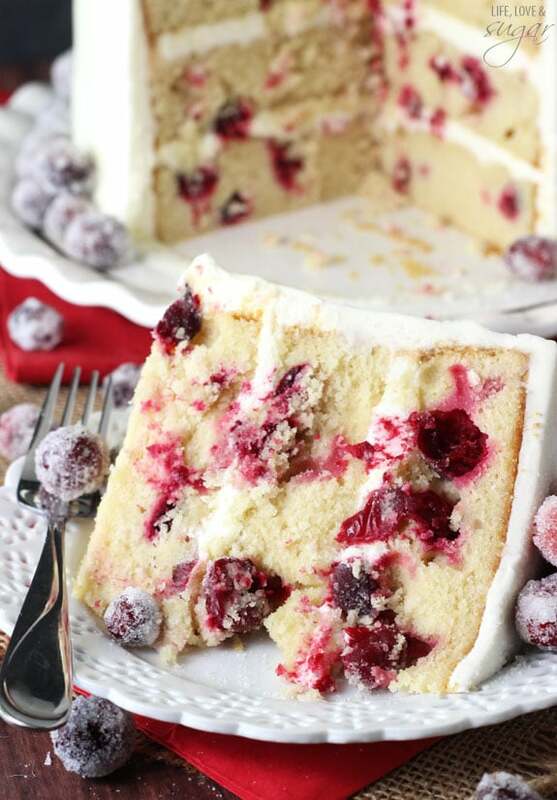 Be sure to store the cake in the fridge before serving. I like to take mine out of the fridge at least 20 minutes before serving to let it come back to room temperature a little bit. I find all cake to be moister and tastier that way. 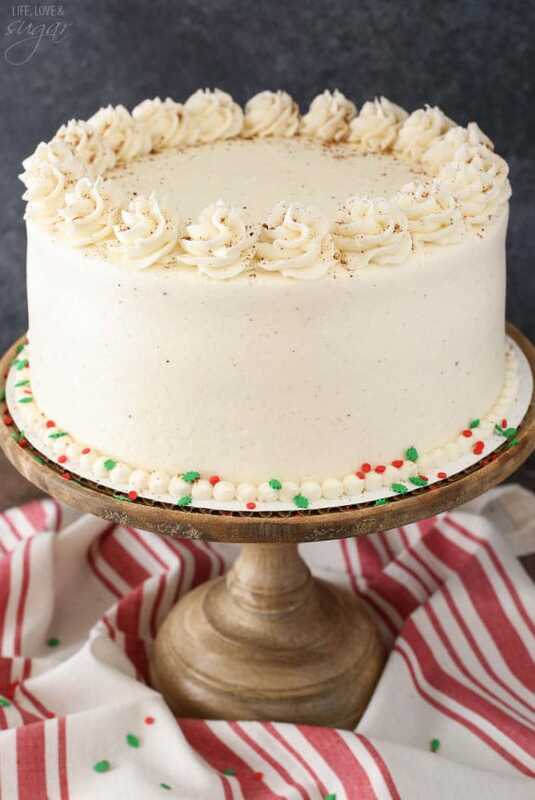 This Eggnog Layer Cake will definitely be a hit with all your eggnog-loving family and friends! We loved it – pretty much irresistible! You do such spectacular work! Your cakes are pieces of art! Good luck to your husband! Just keep him on schedule with his meds. He’ll be loopy, but it really helps! This is gorgeous, of course. I know some people do frosting with cold butter, but I’ve never understood how that doesn’t totally backfire. Yours is beautiful and smooth! Oh, Lindsay, what a beautifully decorated cake! Just speaks Christmas Eve! You mentioned both 8″ and 9″ pans in the recipe. Which do you prefer? Definitely making this! I’m sorry Marilyn! That was an error in the blog post, which I have now fixed. The recipe was correct with the 8 inch pans. Thanks! Umm yea, I am gooing to need a slice of cake. I also have note started Christmas shopping at all. So maybe you will get your gift before New Years. I made this cake and it was truly fantastic!! 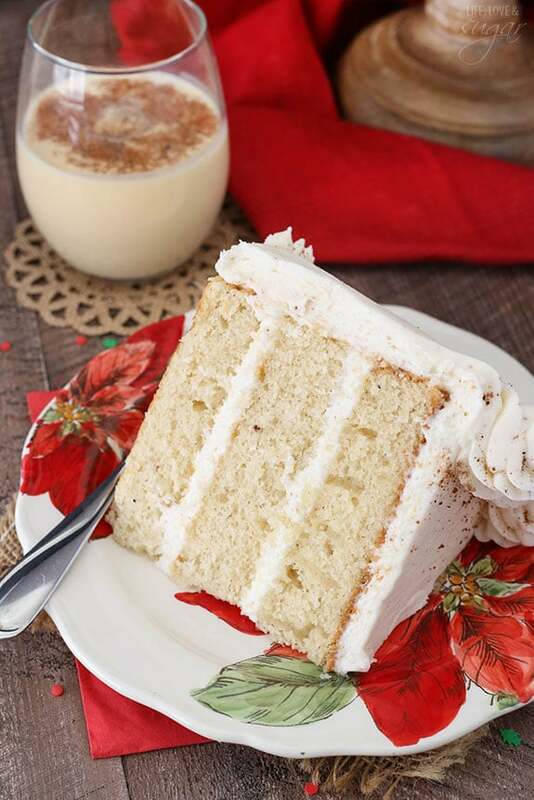 Everyone loved it and it really tastes like a creamy drink of egg nog! 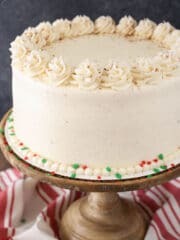 The only changes I made were that I substituted spiced rum for the water in the cake batter and I added an extra 1/4 cup eggnog in frosting. Spectacular! Will be a new tradition for sure!! Thanks!! Awesome! I’m so glad you loved it! The spiced rum sounds like a great idea! I appreciate how you explain the “why” of an instruction, the actual food chemistry and physics that makes for a better cake. It’s not just a bossy instruction!!! Thank you – a wonderful cake and beautifully presented and photographed. 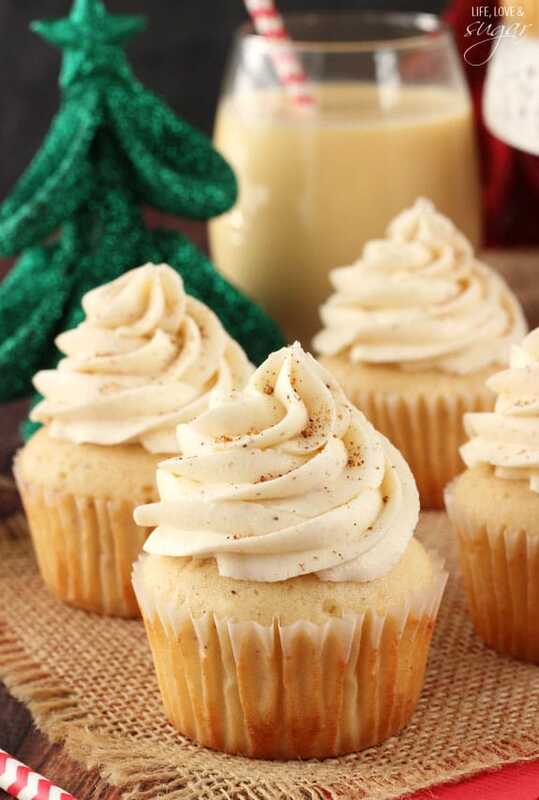 How much frosting does this recipe make? 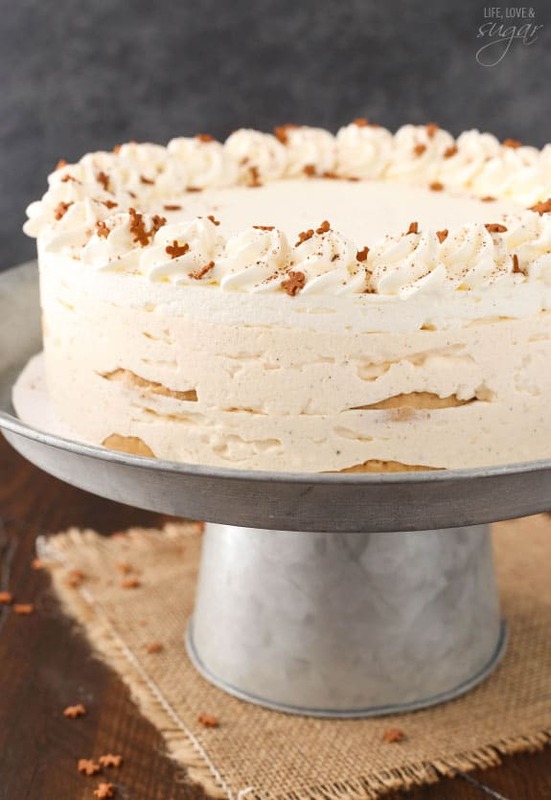 Would you say that all the frosting this recipe makes is absolutely necessary, or would it be okay to cut down the recipe some? I usually use all of the frosting, but I typically use a good bit. You could cut it down if you prefer. This cake looks amazing! Can I make it in two 9″ pans? Yes, you can. You’ll just need to adjust the baking time to probably around 27-30 minutes. There are lots of possibilities, it’d be hard to know for sure. This is definitely a moist cake though. A common issue with dry cakes is adding a little too much flour when measuring with cup scoops. 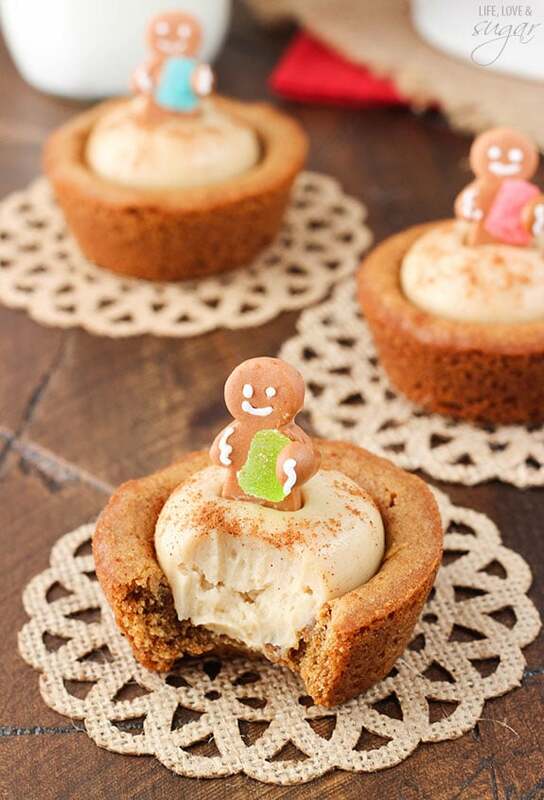 Sometimes people scoop cups differently – be sure not to pack the flour into the scoop. I typically loosen up the flour, then scoop and level. If you have a scale, weighing in grams would be more accurate. Yes, you can definitely make it in advance. I’d store it in the fridge and then serve at room temperature. Hi ! I made some of your cakes and they were always amazing!! Thank you for sharing !! Could you give me an advice? I live in Moscow – Russia. And we don’t have a shortening. How can I change it? What will work? Just swap it out for additional butter. Would it be okay to leave the Rum Extract out? 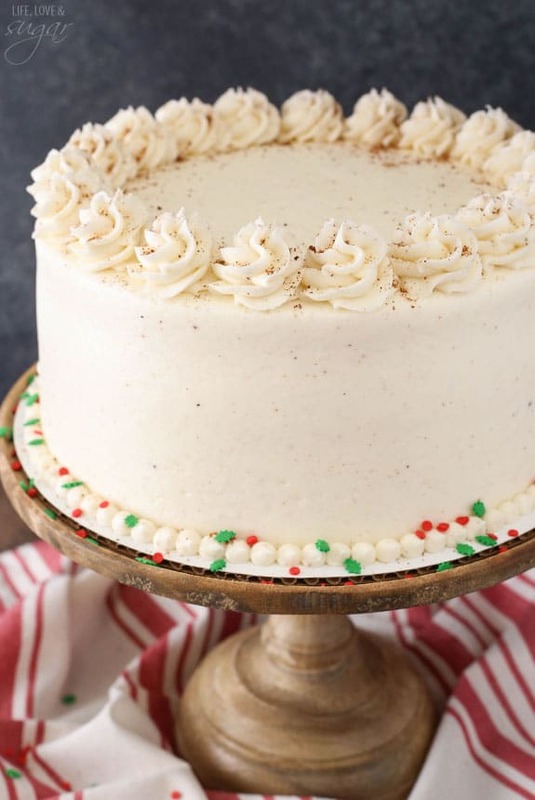 What can i use instead of rum extract in the cake frosting? You can just leave it out if you prefer not to have the rum flavor. Awesome! 🙂 I hope you enjoy it! I’m making the cake right now and I put it in for the full time you said but at the 24 minute period it was still wet in the middle. Any advice on what happened or how much longer i should leave it in? Thanks!!! Can’t wait to try it! Hmm, perhaps there’s a difference in our ovens? I don’t usually need to bake for longer than that. Did you use three pans, or maybe reduce it to two? If so, the layers would be thicker and take longer to bake. Is the 4 tsp baking soda correct? What number decorating tip did you use? I love the effect ! Can’t wait to try out your recipe! I used Ateco 844 for the top (similar to Wilton 1M) and Wilton 10 or 12 (a small round tip) for the bottom. Do I need to make any modifications to the recipe for high elevation? Most likely, but I don’t know much about high altitude baking. Well WAY TO MUCH FROSTING! I had enough for 2 cakes! Not a great cake, will not waste my time making it again???? Can I sub two square cake pans 9”? I plan on cutting in half to make two cakes. Will the frosting cover both cakes? That should be fine, you’d just need to adjust baking times. For the frosting, it depends a bit on how much frosting you like. I would think it should be enough for thinner coats of frosting on both. IT being so close to Christmas, I can’t find eggnog anywhere! Do you think homemade eggnog would change the textures too much? I wouldn’t think it’d be an issue. Could a 9×13 cake pan be used? I haven’t done it, but you could. What do you use to grease the sides of your cake pans? 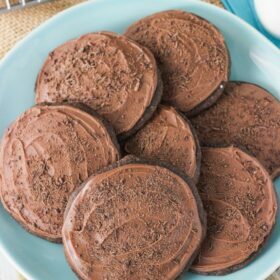 I often use Bakers Joy baking spray and the non stick spray made by Wilton.